A pair of media alerts today from VIZ media detailing the publisher’s participation in 2018 Free Comic Book Day. 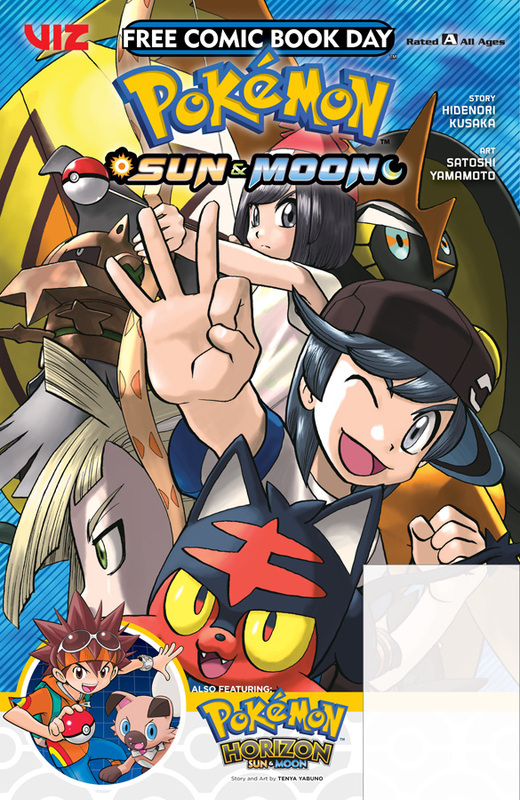 A second sampler showcasing the latest new Pokémon manga - Pokémon Sun & Moon and Pokémon Horizon: Sun & Moon! Scheduled to take place on Saturday, May 5th at thousands of locations nationwide, Free Comic Book Day is an annual promotional campaign developed by the North American comic book industry to help bring new readers of all ages and interests in to independent comic book stores. Free Comic Book Day (FCBD) began in 2002 and is coordinated by the industry's single largest distributor, Diamond Comic Distributors. Readers should visit freecomicbookday.com to find local participating retailers in their area. The hit manga series MY HERO ACADEMIA asks the question… What would the world be like if 80 percent of the population manifested superpowers called "Quirks"? Heroes and villains would be battling it out everywhere! Being a hero would mean learning to use your power, but where would you go to study? The Hero Academy of course! But what would you do if you were one of the 20 percent who were born Quirkless? 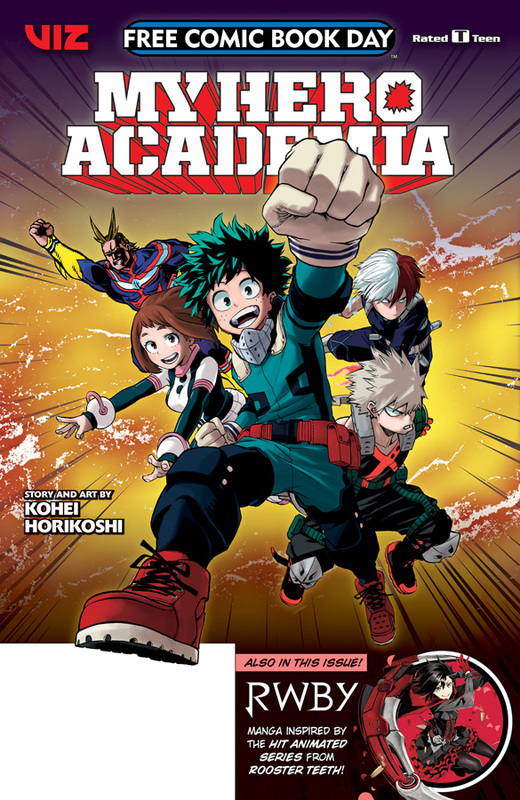 Dive into this acclaimed series by Kohei Horikoshi! Enjoy action-filled chapters from the latest POKÉMON manga series, Pokémon Sun & Moon and Pokémon Horizon: Sun & Moon! Both series are rated ‘A’ for All Ages. In Pokémon Sun & Moon, Sun dreams of money and Moon dreams of scientific discoveries. When their paths cross with Team Skull, both their plans go awry! In Pokémon HORIZON: Sun & Moon, Akira's summer vacation in the Alola region heats up when he befriends a Rockruff with a mysterious gemstone. Together, Akira hopes they can achieve his dream of becoming a Pokémon Trainer and learning the amazing Z-Move. But first, Akira needs to pass a test to earn a Trainer Passport. This becomes even more difficult when Rockruff gets kidnapped! POKÉMON SUN & MOON Vol. 1 will be released exclusively in print on May 8th. Pokémon HORIZON: SUN & MOON Vol. 1 will be available on July 10th. More information on Pokémon HORIZON: SUN & MOON will be released in the near future.